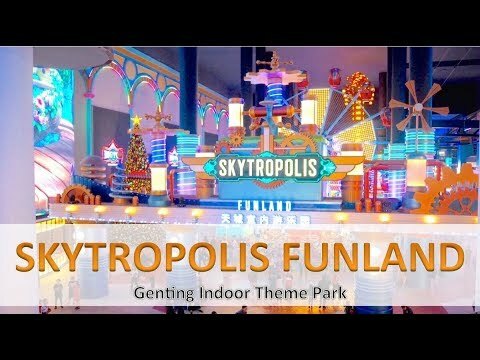 Genting Highlands, 18th January 2018 - Resorts World Genting has breathed new life into its indoor entertainment space, creating the new Skytropolis Funland that was soft opened in December last year after closing for nearly one and a half years. Since the opening, it has attracted thousands of visitors to the resort. Needless to say, this newly revamped indoor theme park is a portal to a new dimension of fun, which will take guests on thrilling adventures and adrenaline-packed rides. From its entrance with actual moving gears, to the thousands of colourful light bulbs that deck out each ride, every inch of the indoor theme park promises extreme fun. 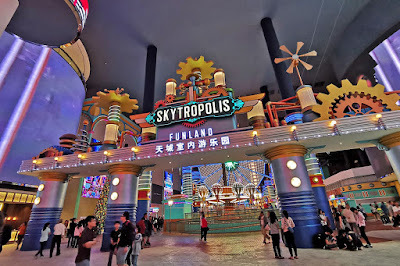 The Skytropolis Funland is spread across four floors is nothing but colourful and vibrant. With mega large LED screens on the walls and even on the ceiling (over 50 meters in length) that light up the park, the new Skytropolis promises an unforgettable time for the whole family. For the opening, 13 rides have been introduced, whilst nine more will follow suit. Covering 400,000 square feet, the indoor theme park includes Asia’s first The VOID hyper reality centre, BigTop Video Games Park and soon the Imaginatrix that combines physical rides with virtual reality. 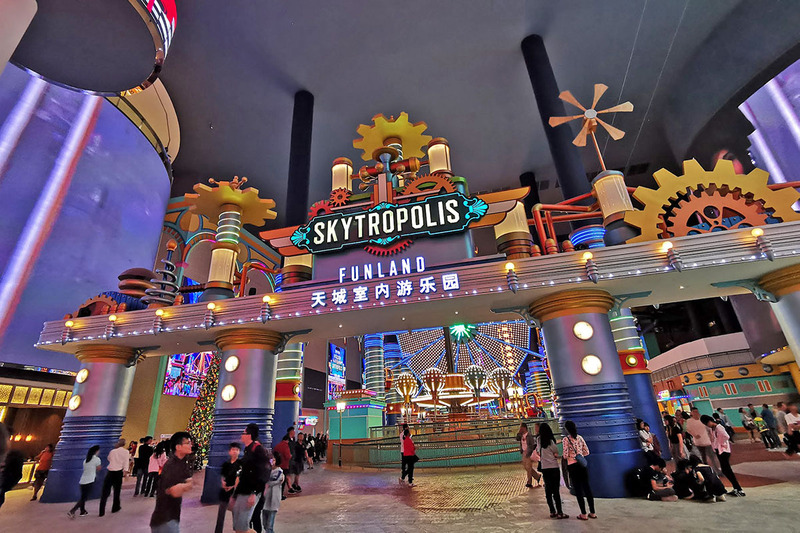 “We are always striving to excite and impress our guests with new experiences at the resort, and with Skytropolis Funland, we have succeeded in creating a carnival wonderland that can be enjoyed at any time of the year by children, adults and families alike,” said Brian Machamer, Senior Vice President of Theme Parks for Resorts World Genting. Previously known as the First World Indoor Theme Park, the attraction saw more than 20 million visitors walking through and enjoying the indoor theme park with more than 1,000,000 tickets sold a year before its closure in 2017. The indoor theme park was ahead of its time with attractions such as SkyVenture, a free fall skydiving simulator the only one in Asia then. With the introduction of the Genting Integrated Tourism Plan (GITP) to re-develop Resorts World Genting, the Indoor Theme Park was part of the plans to be re-vamped to accommodate the new look and feel that the resort was re-creating. This shift in paradigm and outlook has enabled the resort to offer a new ‘Funland’ for guests of all ages to enjoy. Divided into Child, Family and Thrill categories, each of the rides has been specifically designed with a glorious andkaleidoscopic atmosphere. For children, things can start off merrily in the Ride ‘Em Round, a classic carousel of pastiche elephants, lions and horses, whirling around at speed. Pick up the pace in the Whirly Bugs ride, where kids will be seated in pods rotating swiftly around a central spire. Boo Boo Bump provides a spin on the classic bumper cars, while Loop De Loop rotates frantically around an illuminated wrought-iron Genting Tower to shrieks of joy. Kid-friendly drop tower Jumping Spurs with mild drops and climbs will be added soon. Adults can get in on the fun as well, with rides meant for the whole family to enjoy. First, get the adrenaline started with the Copper Express vintage as it 'choo-choos' its way along a 61m track, providing a visual tour of Skytropolis Funland. Space Cadets elevates and spins passengers around for an exhilarating exploration of the solar system. Bring things down to earth with a regal spin on the Royal Carousel, or stay up in the sky in emulation of Phileas Fogg and his journey Around the World in 80 Days in the Balloon Race. Coming soon are the magical mystery Tea Cups, the Charlot Cruise that loops around the park and the Soaring Ships which offers an aerial view that you can enjoy with the whole family. The brave can also take things up a notch in Thrill rides, which up the ante in terms of adrenaline. Start on the ground in a super-sized version of bumper cars meant for guests who are kids at heart in Bumper Boss, then prepare to soar high. Sky Tower takes guests up to the top of an Art Deco tower at a leisurely pace, only to drop them at thrilling speeds to the base. Disco! 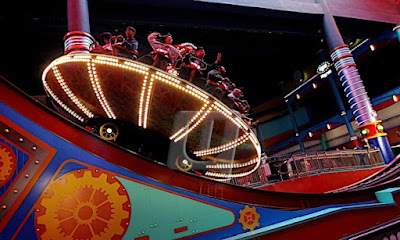 will challenge guests’ orientation, swirling them around a disco ball on a rollercoaster track, while Spin Crazy shows the world from very different angles where up is down and right is left, looping 360 degrees in the air around a central axis. Power Surge will is an intense high-flying ride that will have you round and round and upside down, literally. More rides will be added soon such as the pendulum swing Stormy Voyage, fast spinning turbulent ride Music Express with sudden slopes and backward motion as well as the Super Glider, an old favourite that has daredevils in a suspended lie-down position with sharp turns, curves and sudden drops. In the realm of Skytropolis, even more amazing experiences await besides the carnival rides. The VOID, a highly anticipated hyper reality experience that features cutting-edge technology and world-class content which spans more than7000 square feet, is the biggest centre out of North Americaand the first and biggest in Asia. The VOID uses custom VR technology along with physical stages to create immersive experiences that inspire exploration and engagement. The VOID includes titles from well-loved franchises such as Star Wars (TM): Secrets of the Empire, Ralph Breaks VR, Ghostbusters and their own original spooky experience: Nicodemus: Demon of Evanishment. Last month, The VOID opened in a grand style with two titles, Star WarsTM: Secrets of the Empire and Ralph Breaks VR. This month, two further titles were introduced for a brand-new experience: Ghostbusters and Nicodemus: Demon of Evanishment for guests to enjoy a spine-chilling yet fun time. Compared with traditional location-based VR, The VOID hyper-reality experience brings a completely new immersive experience. It uses custom VR technology along with physical stages to create immersive experiences that inspire exploration and engagement. The VOID’s proprietary designed equipment melds the physical and digital worlds through head-mounted displays (HMDs), backtopTM computers and haptic vests, allowing sensory effects to be felt from multiple points using haptic feedback, that place visitors inside impossible worlds. Join Dr. Ray Stanz himself from the original Ghostbusters team and prove to him if you have what it takes to take down the poltergeists. The owner and only tenant of an old apartment building in New York claims it’s being haunted by an ancient ghosts. Arm yourself with a ‘proton pack’ to save New York City by busting any ghosts in sight. Along the way, fans of the film will be delighted to recognise familiar scenes. It’s time to be a Ghostbuster! Nicodemus is a bone-chilling journey that transports a team of four back in time to the decaying ruins of the renowned Chicago World’s Fair in 1894. The Chicago World’s Fair plays the backdrop as the abandoned site left to rot on the shores of Lake Michigan becomes a place where only shadows and the unknown remain. Guests can explore the hauntingly intriguing exhibits and watch out at every corner as they try to escape the clutches of the demon: Nicodemus. As the first publicly released original title of The VOID developed in collaboration with Ninja Theory, this experience provides guests with a haunting experience as a ‘haunted house’ of sorts with more interaction and exploration with mystery, discovery and adventure thrown into the mix. Star WarsTM: Secrets of the Empire will take guests through a breath-taking journey where guests will feel the impact of blaster bolts, smell smoke from the surrounding environment, push buttons to solve an interactive puzzle to escape enemies, all while coordinating directly with their unit in real time through the blended virtual and physical world. Ralph Breaks VR is an original hyper-reality experience created by ILMxLAB and The VOID in collaboration with Walt Disney Animation Studios, based on their latest hit film Ralph Breaks the Internet. In Ralph Breaks VR, guests will sneak onto the internet disguised as 'netizens' to play the newest, coolest video game ever. Guests will shoot retro alien spaceships, squash pixel bugs, and fend off hordes of bunnies, and kitties in the Pancake Milkshake Diner while they team up with Ralph and Vanellope in the race against time to see who can rack up the highest score! It's all fun and games until an evil security system shows up and threatens to take everyone offline ... permanently. Tickets for all four experiences are available for pre-order on www.rwgenting.com. Single-admission tickets for Star WarsTM: Secrets of the Empire and Ralph Breaks VR are priced at RM130 each, while Ghostbusters and Nicodemus: Demon of Evanishment are priced at RM90 each. Enjoy savings of up to 20% when you purchase a Package Deal starting from RM324 for four. Titles are available on selected dates. Merchandise for Star WarsTM: Secrets of the Empire and The VOID is also available in-store. Visitors can let their fun side loose and venture into a day of family fun at the new BigTop Video Games Park, lit with colourful light bulbs that offer limitless photo opportunities. Here, guests can rest in between rides with carnival-style game kiosks, redemptions machines and video games at the 21, 738 sq ft area. This circus-themed arcade at Level 2 of Skytropolis also promises the best range of cutting edge games for arcade lovers with a whopping total of 150 machines. The Spacetime Squad Virtual Reality game takes it to the next level to give players an out of this world experience. Players must try to stay alert whilst a horde of flying evil robot destroyers and their bosses attack from every side and see the avatar annihilate them systematically. Other top of the line games are the highly competitive PacMan Battle Royale with a cannibalistic element of ‘eating’ opponents; the Jurassic Park where players can try to battle their way through nine exciting missions and meet over 30 species of dinosaurs along the way; the Star Wars Battle Pod where players battle their way through the original iconic trilogy and Storm Racer G for those who love speed. Games are played using a cashless system with the EZiCash card. Come July, visitors can also run, race, research and reveal new worlds in the Imaginatrix area. The latest in VR gaming technology will be showcased with industry leading immersive VR experiences from Europe, Canada, the United Kingdom, South Korea and Taiwan. The VR Arcade area iswhere visitors can enter multiple universes using VR technology whilst the Themed Premium Experiences will take virtual reality to another level where imagination becomes real. The area will include five main VR attractions including a selection of state-of-the-art VR experiences, some available exclusively for the first time in Malaysia. The Q-Ride features a 360-degree view with unique vision synced with the movement of seats as the first-of-its-kind in South East Asia and only the second installation of this technology. As the first in Asia, Paradrop VR delivers the feeling of soaring through the air on a parachute, without the danger. The RoboCoaster isa first for this region with interactive controls that gives guests the amazing opportunity to real the real sensations of the journey that their virtual goggles takes them on. 32-seater XDTheatre (Triotech 4D), the largest of its kind in Malaysia with includes a 3D display, 4D effects, seat movements, scoring and weapon feedback. In Virtusphere, participants step foot in a 10-foot hollow sphere where they can walk and run in any direction whilst viewing a virtual world through a head-mounted display. Those who have a good head for heights can head for the Eagle Landing Zipline, stretching 200 metres across the indoor theme park, four floors from the ground. The zip line which is the longest in a shopping mall in Malaysia, offers a one-of-a-kind view of the indoor theme park for adrenaline junkies who will whizz through, high above everyone. Tickets are at RM31 for one rider, RM25 for two riders and RM19 for 4 riders. A weight and height limit applies for participants. Pay-per-ride tickets are priced at RM10 from Mondays to Fridays and at RM15 on Saturdays to Sundays, Public Holidays, Eve of Public Holidays and on School Holidays. For those looking for an unlimited experience based on the available rides, the Skytropolis Funland Preview Pass is available at RM60. Tickets for Skytroplis Funland can be purchased at the Ticketing Counters or at the Self-Service Ticketing Kiosks. Alternatively, Preview Passes may be purchased online at www.rwgenting.com. Operating hours are from 10am to 10pm. There are currently eight F&B kiosks dotted around Level 1 of Skytropolis. Serving up a wide range of treats that will titillate the taste buds, guests can choose from piping hot Hong Kong bubble waffles served with ice cream or sweet and savoury toppings at WOWfils, to durians in a magnificent array of forms (ice cream, doughnuts, profiteroles, pudding and cake) at Durian Delights. Tuck into a hearty serving of nasi lemak, curry puffs and meat skewers at Malaysian Delights or wander around with bite-sized portions of egg tarts, nyonya kuih, chicken floss buns, sausage rolls or ice kacang from Local Pastries. Guests with a sweet tooth will love the wide range of delicious flavours at Ice Cream & Gelato, while rose hues rule the roost at Think Pink, offering yummy treats like cupcakes, candies, cakes, chocolates and confectionaries like a made-to-order Eton Mess – all coloured pink, of course. And how can a visit to a carnival be complete without a bucket of popcorn – freshly popped and gourmet flavored. Then follow the wafting aromatic scent of butter, caramel and sugar straight to Popcorn and Fairy Floss kiosk. Otherwise, get your hands on sweet and savoury treats for a delicious snack on the go at Circus Snacks.